Asset allocation. Thoughtful and professional asset allocation and a sound investment plan can help to minimize losses and help protect portfolios against volatility and uncertainty. Numerous studies have shown that asset allocation is the primary determinant of the variation in a portfolio’s performance, more so than security selection or market timing. Vehicle and investment selection and monitoring. 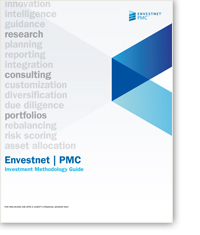 In combination with proper asset allocation, selecting the appropriate vehicle—whether active or passive—is a key component in the investment planning process. For actively managed allocations, intelligent selection of specialist asset managers can help to create a more efficient portfolio. A disciplined and objective multi-factor due diligence process is necessary to deliver thorough oversight in the best interest of investors. This process should reveal best-in-class investment options that demonstrate active value over time, meet industry best practices relating to objective, transparent methodology, and offer an attractive risk/reward proposition according to quantitative rankings and a thorough due diligence process. For passive exposures, a focus on tight tracking to the index, liquidity and cost are paramount considerations. Portfolio construction and rebalancing. Deciding how to allocate across a number of dimensions—domestic and international securities, growth and value investment styles, large and small capitalization, and taxable and tax-exempt fixed income—is critical. When done correctly, diversification across the sub-asset classes can enhance a portfolio’s risk/return profile. Regular portfolio rebalancing is also key to help keep allocations and risk exposures in line. In addition, PMC’s process includes proprietary capital markets assumptions and quantitative ranking models. Capital markets assumptions are the expected returns, standard deviations, and correlations that represent the long-term risk/return forecasts for the asset classes on the Envestnet platform. These values are used to score portfolio risks, assist advisors in portfolio construction, and construct asset allocation models. The Q-Score Ranking Model ranks all mutual fund and SMA portfolios quarterly within each Envestnet peer group over trailing periods. The exchange-traded fund (ETF) quantitative ranking methodology identifies a list of best-in-class beta exposures.